There's a good reason we haven't heard about this epic discovery in the New York Times, Scientific American, or any other legitimate publication, and that is that the preceding photos, like the similar one circulating since 2004 purporting to show a giant skeleton found in the Middle East, are fakes. As if it weren't preposterous enough to claim that one 15-foot-tall fossilized human skeleton had turned up without media fanfare, we're asked to believe that archaeologists recently dug up four of them in a single location (Greece). In point of fact, each of the photos appears to have been taken at a different time and place. So far I've only been able to locate the original of one of them, but it serves as clear proof that Photoshopping took place. Image #4 was created by inserting an outsized human skull into a photo of a 1993 University of Chicago dinosaur dig in Niger, Africa (see the original here). If you look at a blow-up of the doctored image, the skull appears flattened and unnatural (and one of the workers actually appears to be standing on it!). Moreover, the same cut-and-pasted skull was used to create image #2 (see side-by-side comparison). A blow-up of image #2 with brightness and contrast enhanced reveals unnaturally dark "shadows" around the skull. The skull in image #3 is marked by incongruously bright highlights on the teeth and around the edges of the gaping temple wound. And in image #1 the shadows coming off the skeleton fall more or less toward the camera, while the worker's shadow falls due left, suggesting that elements of two different photos were combined. Finally, despite frequent references to "giants" in ancient mythology and English translations of the Bible, there is no generally accepted scientific or historical evidence that such beings ever actually existed (unless you consider the Weekly World News a reliable source). 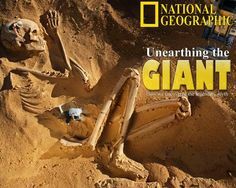 Were There Giants in Prehistory? Les terribles martyrs des 12 apôtres, les pères de l’église… !